Cesare Valletti (December 18, 1922 - May 13, 2000) was an Italian operatic tenor, one of the leading tenore di grazia of the postwar era. He was much admired for his polished vocal technique, his musical refinement and elegance, and beauty of tone. Valletti was born in Rome, where he studied music. He also studied privately with Tito Schipa. He made his debut in Bari, as Alfredo in La traviata, in 1947. He came to prominence in 1950, when he sang in Il turco in Italia, opposite Maria Callas, in Rome. In the same year he made his debut at La Scala in Milan, singing Fenton in Falstaff, a role he reprised when the company took the production to Covent Garden later that year. In 1951 Valletti went to Mexico City to sing La traviata with Maria Callas. He also partnered her in the famous Visconti production of La sonnambula, conducted by Leonard Bernstein, at La Scala in 1955, and again in La traviata at Covent Garden in 1958. 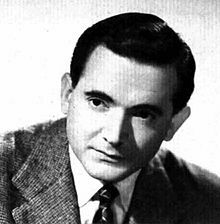 In September 1953 he made his American debut at the San Francisco Opera in the title role of Werther, opposite Giulietta Simionato as Charlotte, and later that same year, in December, he debuted at the Metropolitan Opera in New York, singing Don Ottavio in Don Giovanni. Other roles at the Met included Tamino, Almaviva, Nemorino, Ernesto, Alfredo, and des Grieux. His career at the Met ended abruptly in November 1960 when manager Rudolf Bing replaced Valletti, for no apparent reason, after dress rehearsal in a new production of L'elisir d'amore. Valletti left the Met and thereafter refused numerous offers to return. In 1958, he sang, with Maria Callas and Mario Zanasi, the "London Traviata" that is known as one of the best performances of this opera. In the 1960s Valletti returned to Italy, where he was particularly popular at the Maggio Musicale Fiorentino in Florence. He extended his range to art song, and became a highly respected recitalist. Valletti officially retired in 1967, but returned in 1968 to appear at the Caramoor Festival in New York. There he sang his last role, Nerone in Monteverdi's L'incoronazione di Poppea. After retirement he flourished in a new career in his father-in-law's pasta machine making business. Valletti was married to Nicoletta Braibanti, a granddaughter of Italian composer Ildebrando Pizzetti. Valletti died of a heart attack in Genoa, Italy, while undergoing treatment for liver cancer. He can be heard on "live recordings" in the two aforementioned historical performances of La sonnambula and La traviata with Maria Callas. Valletti can also be heard in a "lighter" cast version of Madama Butterfly which paired him with Anna Moffo. Opera News, Obituaries, August 2000. "Cesare Valletti Sings". RadioEchoes. 1960. This page is based on the Wikipedia article Cesare Valletti; it is used under the Creative Commons Attribution-ShareAlike 3.0 Unported License (CC-BY-SA). You may redistribute it, verbatim or modified, providing that you comply with the terms of the CC-BY-SA.